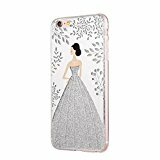 Specially design for Apple iPhone 6 / 6S 4.7″ only. Cute cartoon bride pattern design decorate your phone lovely and make you more attractive and unique. The Flexible TPU cover is equipped with air cushion technology to protect against small drops. Made of durable TPU material, it is clear back case with unique beautiful patterns. The high definition images are printed on the interior layer to ensure the vivid pattern design that will not fade out. Protects your phone against smudges, scratches, dirt,and daily wear and tear. Slim and form-fitted to show the perfect shape of your device. Note: The color maybe a little difference due to lighting and monitor. Hoping you can understand.